Do you want to inspire a culture of mathematics in your classroom and school? 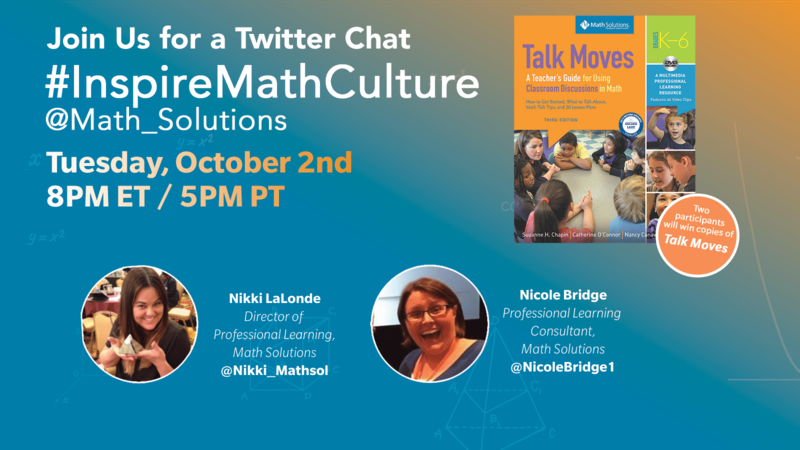 Join @Math_Solutions for our October #InspireMathCulture Twitter chat on Tuesday, October 2nd at 8pm ET/ 5pm PT. Nikki Lalonde, Director of Professional Learning, and Nicole Bridge, Professional Learning Consultant, will co-lead a discussion on how we build a positive math community, and how it impacts student learning. Two lucky participants will be randomly selected to receive copies of our discourse video resource, Talk Moves. Join us for a lively discussion on a culture of mathematics and math community!